Shortly after meeting the man who would become my husband, we went for a skiing holiday in Colorado. Staying with friends in a cabin, we all had dinner duty. Felipe and I, still as awkward in the kitchen as we were in the intimacy department, shopped in the unflattering flourescent lights of the nearby convenience market, and let’s just say that the slope’s powder was much fresher than the local produce. We danced around a menu that would impress but still be made in our cabin’s tiny kitchen. Felipe found some promising trout and packaged, sliced almonds. I spotted the green tops of some firm, vibrant radishes above the bags of pre-washed lettuces, and grabbed a waxed lemon. Our first collaborative meal was born. I’d love to say that it turned out perfect, but there were some burnt almonds, torn trout’s skin, brown butter turned black. Yet the simplicity of the radish salad, with the greens torn and dressed, the roots sliced thin, a crank of black pepper, a smatter of salt, a shot of fresh lemon, rescued the tortured fish. Twelve years later, we share the kitchen as adeptly as Argentinian tango dancers, making it hard to believe that I once felt embarrassed about things like taking my shoes off at airport security, horrified that my new boyfriend would see my bright orange ski socks. 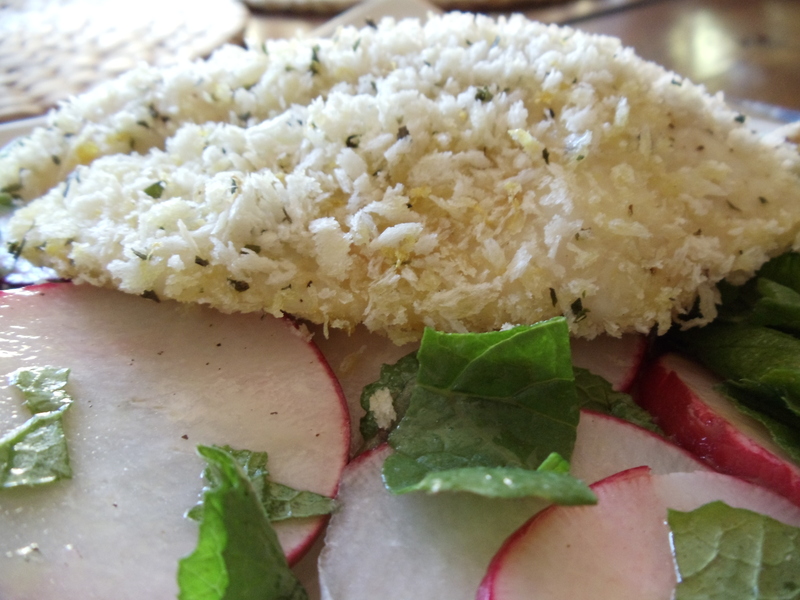 Making this tilapia and radish salad reminded me of those shy, bumbling early days and the grace of a perfect match. 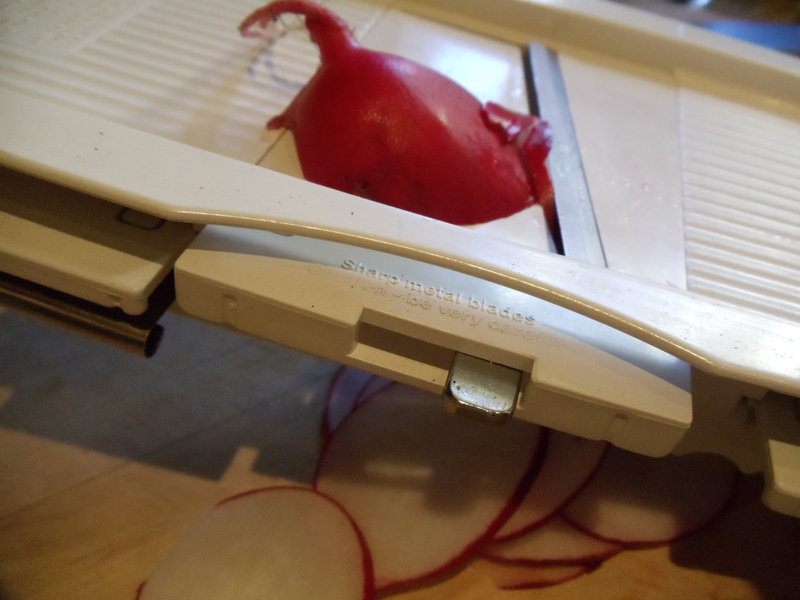 Using a mandolin will guarantee your radish slices are paper-thin. Heat the oven to 350 degrees and line a baking sheet with parchment paper. Coat the tilapia fillets with olive oil, and season with salt and pepper. In a flat dish, mix together bread crumbs, lemon zest, garlic and parsley. Stir to combine, then dredge fish in the breadcrumb mixture, thoroughly coating. Place fish on the baking sheet and into the oven. Cook for 15-20 minutes, checking for doneness when fish is opaque and firm to the touch. Prepare the brown butter dressing. Using a small skillet, melt the butter over medium high heat. When butter solids turn light brown, add the shallots, then cook for another 30 seconds. Remove from heat, season with salt and pepper, and stir in lemon juice. Whisk in the olive oil in a slow stream until dressing is thick and emulsified. Taste and adjust seasoning. Gently toss the dressing with the sliced radishes, greens and almonds. Arrange on a plate, then top with the tilapia. Serve and devour.